it’s contest time once again here at droid life! after racking up well over 400 entries in our last contest, we didn’t want to make any of you wait too long before giving you a crack at another fabulous prize. and this time, we’re rewarding 3 loyal droid life readers! our friends over at GrafiXpressions.com are tossing out three $20 credits towards anything you could want on their site! 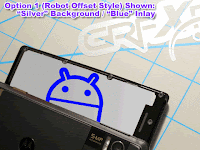 not only do they offer those kick a** colorlays like the white one above, but they have a boatload of android inspired decals which should satisfy all of your droid customization dreams. $20 will definitely get you a ton of stuff to make your droid look completely unique. next friday, march 19th, we will direct message the winners via twitter! so make sure you actually follow us as we’ll be contacting you via direct message. good luck everyone and thanks again to all our fabulous readers and to GrafiXpressions.com who continue to make things like this possible!